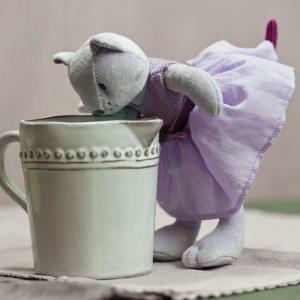 Lucy Willow says - "These beautiful Ragtales soft toys are made by the finest British designers and are full of charm and originality inspired by the heritage of English life. 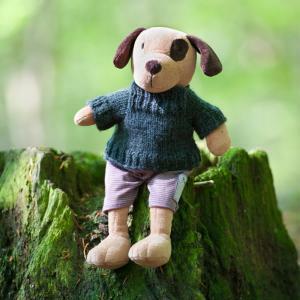 Every one of these toys features lovely details that make a toy special, original designs, gorgeous hand picked fabrics, the highest quality velour, hand knitted clothing all along with distinctive quality packaging contribute to make Ragtales products that little bit special." 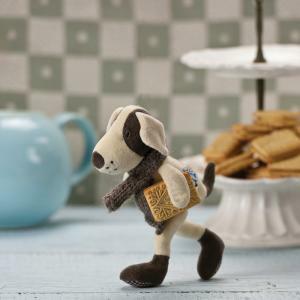 Percy is a beige & brown little dog who comes all wrapped up with a hand made woollen scarf, his floppy ears are lined in a fresh brown polka dot fabr.. Dressed in a beautiful teal polka dot bathing suit and with a lemon beak and feet, Patsy's look is completed with a hand-knitted cream bonnet. ..
Tilly is a brand new size to us measuring 35cms from the top of hair to the tips of her shoes, dressed in a beautiful purple floral print dress and sl..
Just like the larger version of Bo our new Baby Bo Rabbit is just as lovable and will delight any child for many years to come. Baby Bo is made in the.. Arriving in truly regal fashion in a sleigh – bed style display box, this tousle-haired little princess is tucked in for the night. Yet underneath her..